Reflecting on 2017, our NPHI Medical Services team feels a great sense of gratitude for all the support and accomplishments we have been able to achieve together within the NPH community. At NPH, we ensure that every child has access to quality health care at any level, to vaccines, to safe water, to good and balanced nutrition, as well as to health education and a safe environment; all of which are included in NPH core programs. We live in a world full of uncertainty and change; a challenging world the NPH faces every day. NPH has been experiencing and adapting to these environmental changes, transforming its programs to meet the current needs of children and communities. It is exciting to witness and be part of the variety of ways that NPH serves children in nine different countries. One of the most evident results of these changes is the current population in NPH. In 2017, the demographic trends of the population that NPH serves changed dramatically from previous years. Currently, NPH has more adolescents and young adults, and fewer children under five years old. This population pattern prompted NPH to develop new age-appropriate programs and protocols for our largest age demographic, adolescents and young adults. These programs include, but are not limited to: values-based sexual education, Chicas Poderosas (a female empowerment group which promotes gender equality, healthy living practices, and conscientious decisions about adulthood), guidance on for adolescents to care for their own physical and mental health, violence prevention programs, formation on skills for growth toward independence, and both technical and a university education. The programs we share on the next page are among the 16 NPHI core programs. 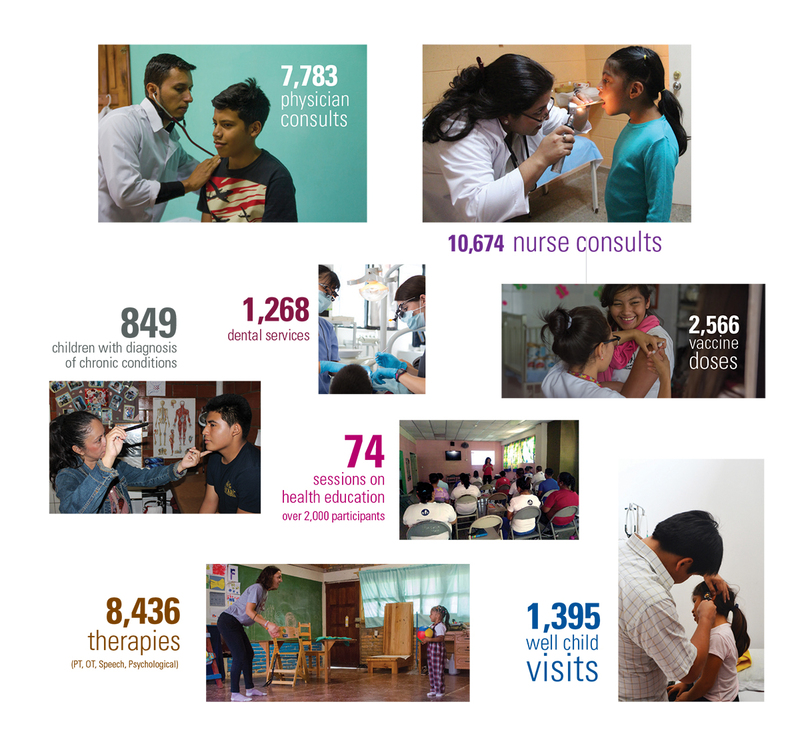 We measure our progress by key standards that align with the United Nations, UNICEF and PAHO guidelines. Vaccines protect children against some of the most dangerous diseases of childhood, some of which can leave consequences for life. The immunization program at NPH is ongoing; we either receives the vaccines from the country’s public health department, or we purchase them ourselves in order to complete the vaccination series as soon as possible, according to the age the full series of immunizations. Vaccinations not only protect the individual, they impact their entire community. Interdisciplinary work administers appropriate treatment, follow up, and further education, always in a transparent manner. Empowering and supporting our staff’s professional development to care for children with mental health needs. Health education and disease prevention for our children, especially in adolescents. NPH reinforces the cycle of awareness, experimentation and repetition, ensuring that our children understand the messages clearly. Sexual education based on human and spiritual values. On average, approximately 75% of children arrive at NPH with signs of malnutrition such as anemia or low weight. Usually, following only a few months of receiving three balanced, regular meals a day as well as additional nutrition when needed, they reach an appropriate weight and height for their age, and NPH physicians monitor the growth and development of every child on a yearly basis. For those who have any delay in their development – including low weight or height – each home has either individual or group programs available to support them. As most NPH programs are in tropical and subtropical areas, protection against mosquito-borne diseases is a must. Malaria, Zika, Chikungunya, yellow fever and Dengue are among those infections easily preventable with mosquito screens, bed nets and other attainable measures. Access to safe water is not only a human right, it prevents diarrhea, pneumonia, parasites, hepatitis and a long list of other preventable diseases. Educating our youth on healthy habits is one essential and cost-effective measure that we use to fight water-borne diseases, with the goal that they carry these skills with them into their adult lives. Our team works hard to ensure that every home has a reliable and lasting water system. Sanitation and waste disposal systems and programs are also essential to preventing infectious diseases. Furthermore, every year, each NPH home joins the worldwide “Handwashing Day”, a UN initiative that promotes this easy, everyday practice that makes a big difference in preventing the spread of infections. NPH social workers and psychologists check in on the health of each child at every visit. If children have chronic conditions, they are also responsible for ensuring follow-up visits with the local specialists and that their medication is available. Each year, NPH faces the risk of being impacted by natural disasters – hurricanes, heavy rains, earthquakes – that bring with them enormous damage and can put our children at risk. Our Medical Services team proactively developed a healthcare manual to better respond to natural disasters in the future. NPH Medical Services has also developed policies and guidelines for the prevention of sport injuries, patients’ security, waste management, disaster preparedness, health guidelines for caregivers, nutrition, injury prevention, documentation, and tracking, all in consultation with best practices in the healthcare industry. Finally, we would like to thank our partners: the IT support that we received in going paperless, using the Electronic Medical Records, reporting online, medical brigades, and the various experts that supported us in the areas of pediatrics, neurology, ophthalmology and dental, as well as helping us provide hot water to the kids homes in Kenscoff, Haiti. Your support has made 2017 a great year. On behalf of the NPHI Medical Services team, we express our deepest gratitude to these professionals and teams, and all those who have provided us with continued support.